A Flash Flood Warning is in effect for the region until 8:15 PM. Do not drive around road barricades. 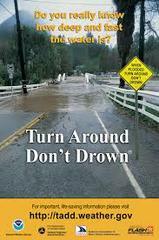 Do not drive through flooded roadways...."TURN AROUND, DON'T DROWN".